LOS REYES, Costa Rica, Mar 15 2016 (IPS) - Before they got involved in farming, Luis Diego Murillo and Xinia Solano paid their bills and put food on their table with Luis’s salary as a foreman on construction sites, an unstable job that kept him on the move. Now the 33-year-old Costa Rican walks along the rows where he and his wife grow bright green coriander and lettuce, and where stalks indicate a handful of radishes under the soil. They share the land with another family, but they are their own boss. Over Murillo’s head is an enormous roof of black shade cloth which is crucial to his new life because it protects his crops in the community of Los Reyes, in the rural municipality of Coto Brus, Puntarenas province, in the foothills of Costa Rica’s Talamanca mountain range. 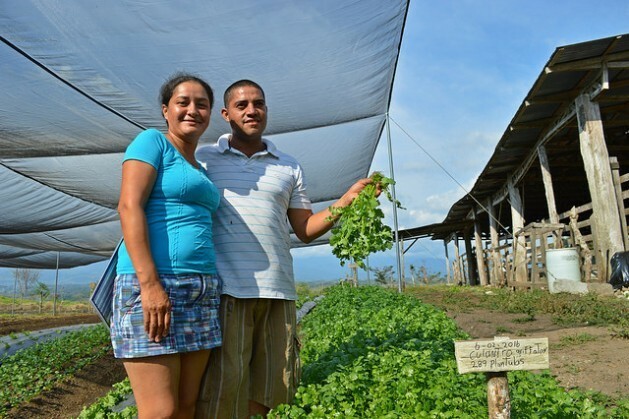 Murillo and his wife, the 34-year-old Solano, are among the 74 families who have benefited from the Shade House programme that the United Nations Food and Agriculture Organisation (FAO) is carrying out in southeast Costa Rica. In the protected shaded areas, 700 square metres in size, the farmers can manage the quantity and quality of sunlight, the percentage of shade and the impact on the crops of rainfall, which can be heavy in this area. The families are thus able to grow fresh vegetables year-round, have boosted the quality and productivity of their crops and have even managed to grow vegetables that were unthinkable before, given the normal conditions in this area, such as broccoli and cabbage. With this system, which began to be implemented in late 2013 on just six farms, the families produce food for their own consumption and earn an income selling the surplus. “We’re very happy because thanks to the shade houses we don’t have to go out and buy food anymore. If you want coriander or a head of lettuce, you just come out and pick it,” said Solano, whose house is in a village next to Los Reyes, which is a six-hour drive from San José, although it is only 280 km away. Another of the advantages of the programme is that it improves and helps diversify the diet of rural families in the socioeconomic region of Brunca, the area with the highest poverty level in this Central American nation of 4.8 million people. Poverty affects 34.6 percent of households in this region of 300,000 people, compared to a national average of 20.6 percent, and only 51 percent of the economically population is employed, according to statistics that FAO provided to IPS. This region only produces 15 to 20 percent of the fresh fruit and vegetables consumed here, and the rest is brought in from other parts of the country. The families with shade houses are now eating better. “We eat salad every day. We used to buy stuff for salad if we had the money, but now we don’t have to buy it,” said Solano. The shade houses are also looking at larger-scale production and marketing of their crops, to boost family incomes. The families participating in the programme already grow more than 25 different kinds of fresh vegetables. Each shade house costs around 3,200 dollars, and the funds are provided by the Costa Rican government institutions working with FAO on the project, such as the Mixed Institute for Social Aid (IMAS) or the Rural Development Institute (INDER). The programme, which also has the support of the Ministry of Agriculture and Livestock, is focused on the entire family, and considers women’s contribution as key. “The women here are very brave, most of them even pick up the shovel and plant. It was my wife who planted all of those plants (that provide shade for the coffee bushes),” Florentino Amador, a 54-year-old farmer, told IPS with pride in his voice. Ligia Ruiz, 53, one of the most enthusiastic farmers in the four shade houses in Los Reyes, coordinates sales with her neighbours. “On Wednesdays and Saturdays we harvest what we’re going to sell, just here in the community for now. I get the orders and we deliver the produce,” she told IPS. Although each shade house was originally designed for one family, in Los Reyes the four shaded areas are worked by 10 families, who farm together in a very horizontal process; for example, the income from the sales goes into a joint fund, where they hope to save up for the cooperative. “If there’s a lot to clean on one lot, one family helps the other, and then they in turn receive support,” said Ruíz with regard to the revival of the rural tradition of communal work. The FAO’s aim is for the beneficiaries to be organised groups of farmers with access to a collective storage and trading centre, although the families are selected by the Costa Rican institutions involved in the project. 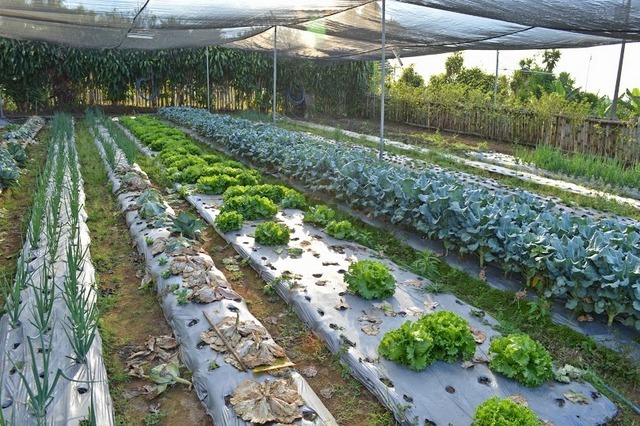 In Brazil and Mexico there are small-scale initiatives similar to the shade house project, said Guillermo Murillo, a FAO consultant who has worked in those countries and suggested the shade house model for Costa Rica. Besides the support for setting up shade houses, the team of representatives of the FAO and the public institutions involved in the initiative give advice on farming techniques, tools, and marketing. 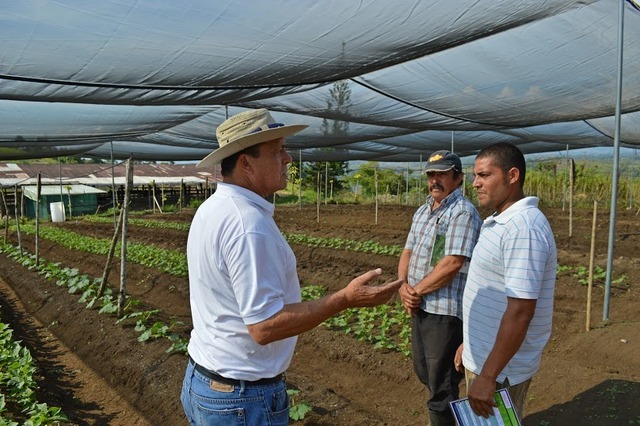 The programme is now being expanded to the northwest province of Guanacaste, where the installation of the first shade houses outside of the Brunca region has been approved.